This class runs for 30 minutes with a maximum of 5 children per class. Classes at Beaver Swim School are designed with the age and physical development of your child in mind. 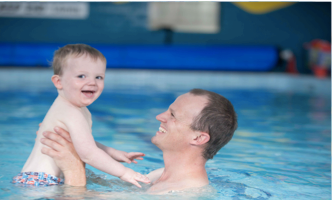 Our qualified infant aquatics instructor will guide you and your child through a series of exercises and games designed specifically to perceptual motivation and motor skill development. Appropriate swimwear, fitting snugly around the legs, is to be worn by infants and young children. Please encourage your toddler to use the toilet prior to lessons. If your child has a bowel movement during the lesson you must leave the water and change into clean clothing before re-entering the water. Independent movement/propulsion, eg glide through hoop. We also encourage dog paddle as a young child is physically capable of performing this stroke. Breath control and submersion - our experienced instructors are able to recognise when your child is emotionally and aquatically ready to begin their first experience of submersion. This process from initially wetting the face to complete body submersion will be at the child's own pace.